It was a beautiful day for golf. 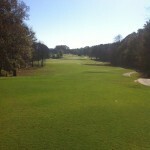 The beautiful Fields Ferry Golf Club in Calhoun, Georgia hosted the annual Georgia-Tennessee Golf Challenge. At the end of the day, the Challenge Trophy returned to Tennessee after two years of being in the possession of the Georgia team. Jim Shemwell. Former Jefferson Dragon basketball coach ( 1973 - 76 ) and a former Dragon star athlete, Andy Wilkes, teamed up to take down the Georgia team of Fred Tolbert and Cecil Buffington. The Georgia team fought back from a 3-0 Tennnessee lead by winning the 15th, 16th and 17th holes. Mostly on the superb play of Fred Tolbert, who won all three of the holes with some of the best golf of the day. The match was all-square going to hole number 18. On that last hole, Andy Wilkes played the par 5 hole to perfection and won the deciding point to send the challenge championship back to Tennessee. Now it's wait until next year for the Georgia team. Cecil Buffington summed up the Tennessee win . . . "They outplayed us most of the day. Even with that, we had our chances to win the match, but missed some very makeable putts that kept us behind until the rally toward the end of the match. It was a fun day of golf with some long-time friends that featured alot of good golf shots played by both teams. Hopefully, we can regain the trophy next year." Andy Wilkes, Jim Shemwell, Cecil Buffington and Fred Tolbert. Jim Shemwell on the tee box. Fred Tolbert watches the action. The 18th hole at Fields Ferry Golf Club in Calhoun, Georgia. Andy Wilkes, Jim Shemwell and Fred Tolbert. Coach Shemwell will carry the Challenge Match trophy back to the Volunteer State in 2017. Cecil Buffington, Jim Shemwell and Fred Tolbert. Andy Wilkes sets up for another long drive.